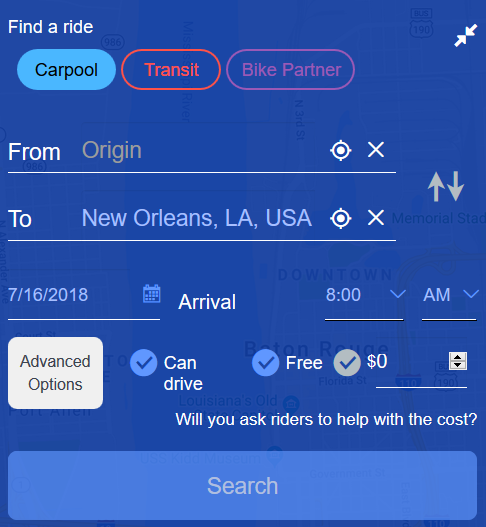 commuteSMARTseacoast | How Do I Request A Ride? When you request a ride, you are looking not to drive but to ride with someone who is. Select your desired date and time of arrival. If you can drive, check the 'can drive' checkbox, and indicate whether you would want others to help with the cost if you are the driver. Next, click 'Search', and matches for your ride request will be displayed below. If the driver is asking you to contribute towards the cost of driving, you'll see the amount requested. Note that our web site does not collect any money or charge a fee. Any payment between you and the driver is an arrangement strictly between the two of you.